How Can I Go 30th Century Bicycle? Where is 30th Century Bicycle in Iowa City on the Map? We have purchased two bicycles at 30th Century -- one a new Surly LHT and the other a used mountain bike. We love both bikes and have had excellent service. Great tune ups, helpful advice, and lots of fun bike stuff to oogle at in the shop. Top rate LBS! 30th Century Bicycle is the perfect illustration of an ideal local business. They are little in all the right ways. They are active in the community and develop personal relationships with their customers. On the other hand, they think big. They carry a great selection of mainstream and niche cycling products, and their business is structured around environmentally conscientious standards. I can't recommend this shop highly enough. 30th Century Bicycles is an awesome local shop! Steve and Cody are knowledgable about all bicycle products. They are not an in-your-face-we-must -sell-stuff-to-you shop. 30th Century Bicycles is a strong supporter of bicycle commuting and bicycle advocacy. They do a great deal of used bicycle sales too. The service is outstanding, and they have fast turnaround. 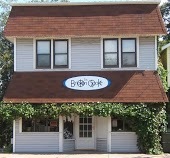 If you are looking for a great local bicycle shop, look no further...30th Century Bicycles is the place to shop!